I've had a busy week. I took the written test to renew my drivers licence for another five years. The next time I will take the test I will be 78 years old. Ouch! There were 18 questions and I missed two. As a reward for passing I treated myself to a new tea set. My birthday is Tuesday June 3rd and I've wanted this tea set for years. Happy Birthday to me. Now you know the rest of the story. Lenox 'Butterfly Meadow' 7 piece tea set. My tabletop has turned into a sun-soaked butterfly haven! From my breakfast table to my tea table. This gently scalloped tea set will brighten my tablescape with a yellow and blue butterfly pattern fluttering above vibrant florals. Delicate details are so sweet. A little lady bug in the tea cup. (Tuesday Morning) One napkin in the tea cup and one in the tray. Soft pink flowers on the sugar and creamer and a pink flower bud as the handle for the sugar bowl. this journey to complete this beautiful table setting. A little peek at my birthday present to me. A very Happy Birthday to you. I feel we should always treat our self's to a BDay gift. I had to take the test last year so I am good for 4 more years. I always get so nervous when I have to take it. I love your tea set - the whole set is beautiful. Congratulations on passing your tests to maintain your drivers' license and especially on acquiring such a precious and beautiful tea set as reward ! I love the pretty butterfly tea set and the dinnerware.. Congrats on passing your drivers test, I have only had to take an eye test here. Lovely photos! Happy June and have a great week! Happy Birthday to you. What a special treat you got for yourself. Good for you. And good for passing your test. A Very Happy Birthday to you, Betty! You gifted yourself with a very sweet tea set. I love all the little adornments like the ladybug, the butterflies, and the rose bud! The dinnerware is lovely and makes a wonderful setting especially for this time of year. I would love to join you for tea in your beautiful garden! Thank you for joining me for tea and have a splendid day tomorrow. Happy Birthday, and a new tea set to match your dishes is the perfect gift to give yourself. Happy Birthday to you! I love Lenox and butterfly meadow is so much fun. Perfect for summer, too. Good for you! Happy Tea Day! Happy Birthday! I love your Butterfly set...so pretty! And congrats on passing the driver's exam...always so stressful. The china sets a perfect tea table! What an exquisite china pattern! Truly, one to drool over. Happy birthday to you. I hope it's a day filled to overflowing with love and joy and that it marks the beginning of a wonderful new year of life. Congrats on the renewed driver's license. Where I live, to renew, you don't have to take a test. At least that's how it was when I renewed 2 years ago. And yay for you that you passed your driver's test! That is great to get done with. on your tray in the sun. Happy Birthday! Love your dishes, so dainty. You have two amazing places to sit and enjoy your coffee and tea...so nice! I love this pattern. I have a couple of pieces and think that it is so pretty and feminine. So perfect for spring and summer. Butterfly heaven to me and I just love looking at dinnerware and sets like this. So happy I found you on Wow us Wednesday today and I have to pin some of your lovely tablescape now. 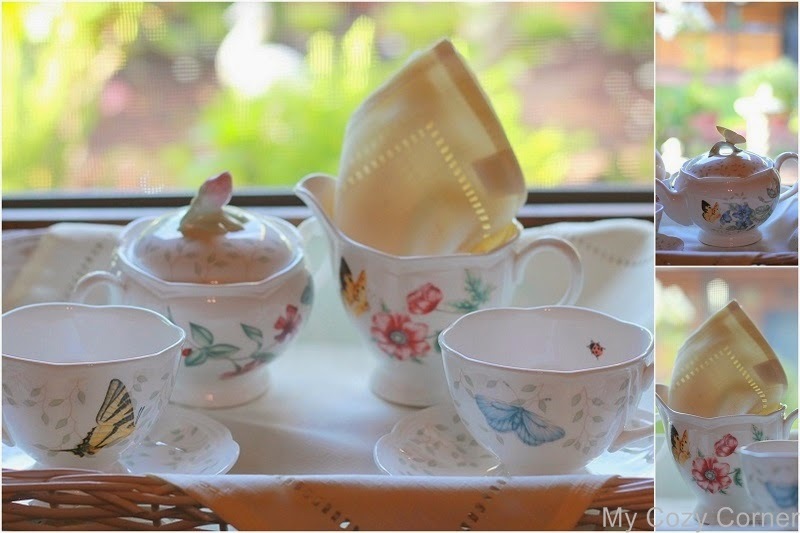 Femininity at its finest in your Butterfly Tea Set, dear one!!! I adore the soft buttery hue of the linen napkin as an accent! The out~of~doors photo with the coffee pot is so~o~o inviting! Congratulations on the passing of your driver's license!!! Many more years of happy motoring!!! Love, love, love this tea set! I can't say enough how lovely it is...looks great.